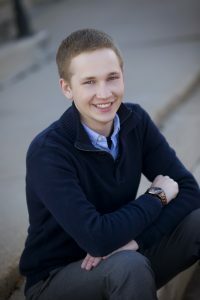 UNC-Chapel Hill student Brent Comstock, who is majoring in business and religion studies, is CEO of BCom Solutions, Managing Director of the CarolinaGo mobile app and Student Entrepreneur in Residence at Launch Chapel Hill. He first shared this reflection of the Adobe rollout on his social media channels. When I first arrived at Carolina, I did what any other freshman would do: sign up for everything and overburden myself with the hopes of finding my place on campus. This was especially important for me as I struggled with the fact that my freshman dorm housed more people than my entire hometown. One of the “projects” I signed up for was establishing a better partnership between the Information Technology Services department and the student body. At first, this took place within a student government role. As the responsibilities grew, however, I decided to spend much of my college career working to provide better technology access to everyone campus. Over a year ago, several students and administrators began asking about Adobe Creative Cloud. Like any university or large institution, you have to identify a need and a benefit before you can go any further. While the idea of “Photoshop for everyone” sounded great, buy-in and proven use of the platform was the key. I began working in 2015 with Chris Kielt, UNC-Chapel Hill’s CIO and Vice Chancellor for Information Technology, to identify needs of students and staff on campus. The question we were really addressing: can Creative Cloud be integrated into every aspect of campus life? While I was the voice of students on this topic, I also began conversations with my professors about how they could use the leading creative suite to build projects and curriculum that would not only challenge the students, but also give them the opportunity to learn software platforms used by professionals every single day. As I began asking around campus, I realized what an incredible opportunity this could be. I had seen the effects of this type of deployment in other areas, particularly at the University of Nebraska, where my company, BCom Solutions, sourced many interns. Over the last three years at UNC-Chapel Hill, I have grown to develop a great working relationship with Chris and his team. This project, like all of our other projects, would require buy in and proper implementation from every area of campus. Of course, the important thing to me was ensuring we had students who would use the platform. Chris and a team of University leaders began to discuss the topic more in early 2016, and a real spark was lit when Adobe facilitated a visit to Clemson to check out the “Adobe effect” on their campus. On the surface, the Creative Cloud is a design platform for creative designers. Clemson, though, took this to a new level by building digital labs, classes and student opportunities around the Adobe suite. After all, if you don’t use it, you lose it, right? Upon returning from our Clemson visit, different leaders on campus began to seriously look at the opportunity. When I left campus in May, we were still in the conversation phase among different entities. And, like most University functions, I didn’t expect an urgent deployment anytime soon. I was proven wrong when Chris called me right around my birthday in June and asked if I could get written support from students on campus. Boy could I. I swiftly prepared a letter from student tech leaders on campus voicing our support for the new initiative. From there, everything seemed to fall in place. Now, I must say that I had a very limited view to the actual negotiation of the deal since I am only a student, but in my opinion, this is maybe the fastest deployment of a software platform that I’ve ever seen. 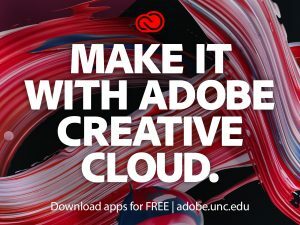 In the fall of 2016, Adobe Creative Cloud was made available to all students. I was given the task of sharing the launch on social media. For someone who loves technology, I had a certain level of anxiety when given the keys to UNC-Chapel Hill’s thousands of social media followers. We promoted the launch on Facebook, Snapchat, email and Twitter. Additionally, many areas of campus announced or even helped students and staff get the suite set up on their computers. The great thing about launching this program has been the creativity that sparked within many people and areas of campus. Professors are building digital literacy components into their curriculum, students are learning applicable skills to the real world and organizations and departments on campus have access to an incredible set of digital resources. The most exciting part of the story is that we’re just skimming the surface here. While I won’t be at Carolina next year to watch the initiative grow, I can’t wait to see what happens next.